The furniture should be placed in west or south direction. The furniture such as showcase or heavy articles etc. should be in south or west direction. It should be rectangular or square, not in oval, circular or odd shape. T.V should be placed in the southeast direction. Living room Vastu opposes to place T.V. in northeast or southwest corner. Cooler or A.C should be placed in west or north direction. Avoid A.C or Cooler in southeast and northwest. The telephone should be placed in East, North or southeast. It should not be in the southwest or the northwest corners. Aquariums are beneficial to place in the North, East, and North-East of the living room. The faults related to the northwest corner can be corrected by putting an aquarium. Avoid aquarium in the south direction as it draws out positive energies from the house. The use of painting can create a pleasant environment in the room. Painting of waterfall, rising sun provides positive energy. Avoid paintings that symbolize death, violence and negative aspects of life. The color of the wall in the living room should be white, yellow, blue or green. Prefer light color over dark colors. Avoid black and red color in living room. Lighting of the living room should be bright. If the chandelier is in the living room, it should be slightly towards west, not at the center of the room. The door of the living room should be in east or north direction because doors are very auspicious in these directions. There should not be a photograph of any God in the living room or at the entrance door. Windows in east and north are beneficial. The East and North are best directions for the living room. The furniture should be square or rectangular. Air-conditioner or cooler should be placed in West direction, not in South-east. Portraits of women, animals, birds, scene of war should never be displayed in the living room. 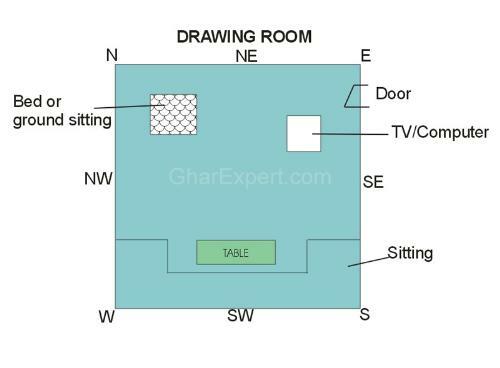 The sitting arrangement for the head of the family should be in East or North direction. A painting showing depression should not be placed on a wall.